Inspired by the work of Brazilian artist Eduardo Kobra, I set up this photograph in the snow this afternoon. Kobra began his street art in the largest city in South America, Sao Paulo, initially on the wrong side of the law, tagging buildings with spray paints. What turned his career around was a sympathetic judge who, impressed with his artistry, sentenced young Kobra with a commission. He made him paint a mural on the police station wall. Kobra’s work has a larger than life, graphical realism, stretching tall and wide along walls and up the sides of buildings. They are portraits of people well-known or not-so known made more striking by his vibrant mix of spray-painted rainbow colours in blocks and stripes. The connections in this photograph to Kobra’s work start with my daughter’s ski jacket, patterned and coloured in a similar way to his murals. Then comes her musical performance in front of the brick wall of the local library (one of Kobra’s wall-paintings shows a Mexican trumpet player). 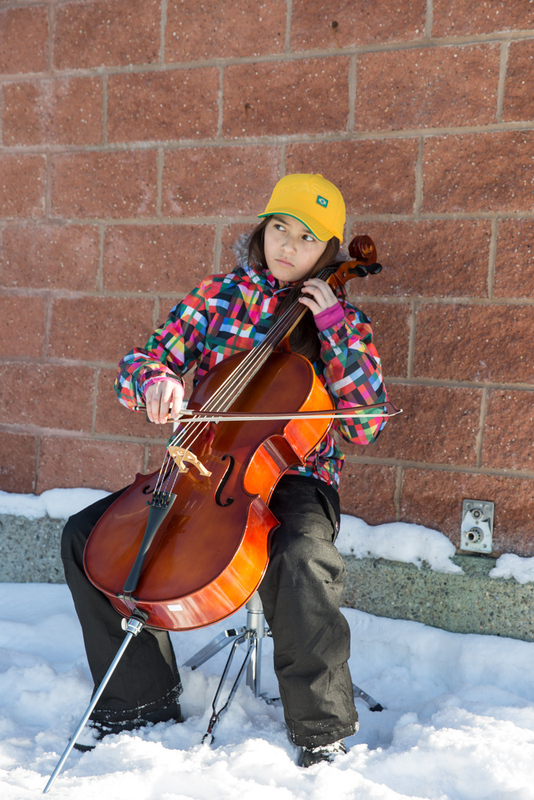 Her cello-playing was rather short as the cold quickly got into her fingers. The flag of Brazil, a common element found in his paintings, is also there on the front of her hat. 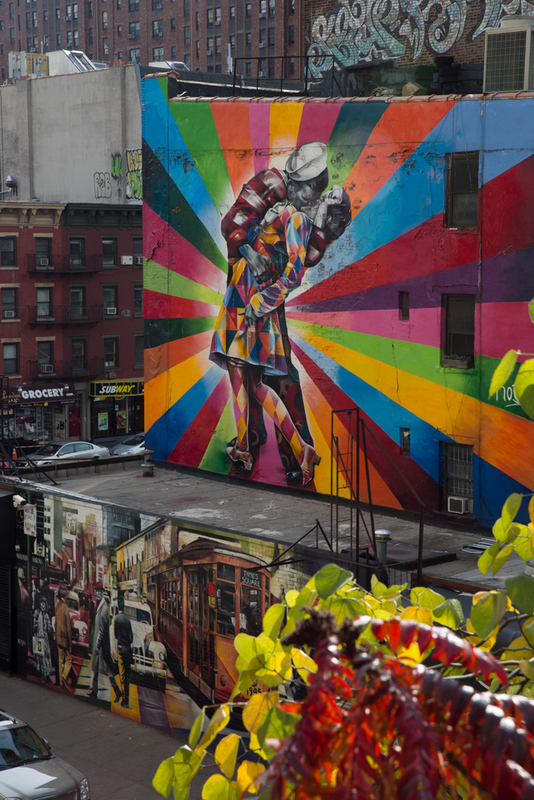 My first-hand, in-street, viewing of the wall paintings of Eduardo Kobra came last year when I was walking the High Line in New York City. It is located on 25th Street at 10th Avenue in the Chelsea neighbourhood of Manhattan. O beijo depicts a sailor kissing a nurse in Times Square on VJ Day. This symbol, a suggestion of love surpassing war, is based on an iconic photograph taken by Alfred Eisenstaedt, an early master of the candid photograph in 1945.